Reading about David and Saul can teach valuable lessons. In 1 Samuel 24 and 1 Samuel 26, David is presented with the opportunity to kill Saul… twice. Both times he chooses to spare Saul's life and put his trust in God. To show how close he comes to killing Saul, David first cuts off a piece of Saul's robe, and then he takes his jug and spear. When Saul sees these items and learns what David has done, he tells David he is blessed and promises not to try and kill him again. From this story, children can learn about trusting God and not seeking revenge. Remind children that King Saul has been trying to kill David because he is jealous and thinks he will be a threat to the throne. Then read 1 Samuel 24 and 1 Samuel 26, which tell the story of how David spares Saul's life twice. Why didn't David like Saul? How did David show Saul he had the opportunity to kill him? What was Saul's reaction when David didn't kill him? Write the word REVENGE on a large piece of chart paper and ask children if they have heard of that word. Explain that revenge is similar to the feeling you get when someone hurts you and you want to hurt them back. Ask children to give examples of when they have felt that way and write the examples on the chart paper. Ask the children again, "Do you think God wants us to take revenge?" Read the examples from the chart paper one by one and ask the children what they could do in each scenario instead of taking revenge. Have children create a special spear to remind them not to take revenge. 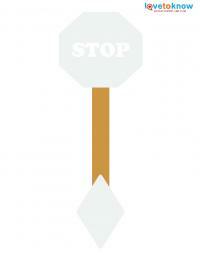 Children can color the stop sign and spear before cutting them out. Cut out the stop sign and spear. Glue the stop sign to one end of the craft stick and the spear to the other end, leaving about four inches between the two. Tell children that their spear will remind them to stop when they want to take revenge on others, just like in the Bible when David's men wanted to kill Saul and he told them to stop. Cut out the stop signs containing Leviticus 19:18 and read the verse to the children again. 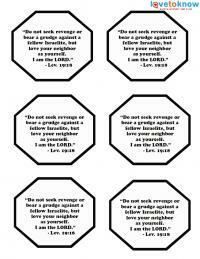 Help them tape or glue the verse to the back of the stop sign on their craft. Make the verse their memory verse for the next week. In addition to the story of David sparing Saul's life, extend the lesson about revenge by sharing other Bible stories that involve seeking revenge. Stories such as Simeon and Levi in Genesis 34, Samson's revenge in Judges 15 and the story of Joab and Abner in 2 Samuel 3 can help children see the consequences that come from seeking revenge.